The Incas Civilization: Religion and Gods. Intihuatana Stone, Cuzco, Machu Picchu.. The religion of ancient peoples, as well as their manners and customs, depended, in large measure, on the climate of the region where they lived. If it was a warm region where the sun was oppressively hot in the middle of the day and the nights were pleasant and cool, there was less temptation to worship the sun. On the other hand, there was a marked tendency to worship the stars and the moon. Familiarity with these heavenly bodies led to that knowledge of astronomy, and even astrology, which is so marked a feature of Arabian civilization as well as that of the Mayas in Central America. 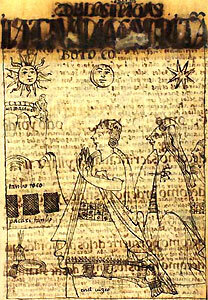 On the other hand, in the high Andes, on the Peruvian plateau, where the rarefied atmosphere does not retain the sun's heat and the nights are bitterly cold, it is not surprising that little attention was paid to the stars, while the most profound worship was accorded the sun. Other natural phenomena such as thunder and lightning, high mountains, dangerous precipices, and water-falls, came within their ken and naturally were propitiated by offerings and a certain amount of worship so as to protect human beings from harm. 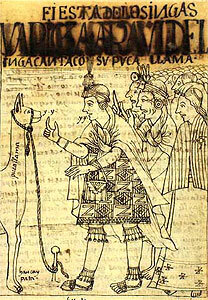 Divinities of the Inka, Waqa willka inkap. Most important of all, naturally, was the sun, without which crops would not grow, and life, generally, was intolerable. Its favor must be sought. As the sun went farther and farther north and the shadows lengthened in the month of June, it was natural to fear that the sun would continue its flight to the north and might leave them eventually to freeze and starve. Consequently the priests of the sun, able, on the twenty-first or twenty-second of June, to stop its flight and tie it to a stone pillar in one of their temples, were regarded with veneration. When the shadows ceased to lengthen and became shorter until the sun was once more overhead and his kingdom firmly established there would naturally be great rejoicing. The period of the summer solstice was one of joy just as that of the winter solstice was one of fear. It is probable that the priests of the Sun, whose lives depended on their being successful in appearing to control his actions, had learned to read the length of the shadows cast by the huge sundials called intihuatana, or, "the place to which the sun is tied." Feast of the Inkas: wariqsa, dance; arawi, song of the Inka. He sings with his red llama. One naturally expects to find these sacred stones within the enclosure of the sanctuary or temple where the sun was worshipped and where the Chosen Women were taught to become his hand-maidens. There they learned to be useful wives for priests and nobles who could depend on them to weave beautiful garments, cook toothsome dishes, and brew excellent chicha with which the heart of man might be made glad and his spirit raised from the heaviness caused by toil or fear. 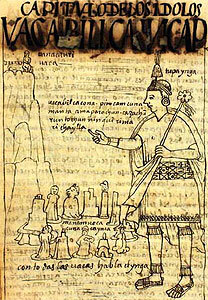 One of the most important spots in the Andes would be the ruins of a sanctuary with its temples of the Sun, Moon and Stars, its intihuatana, its supply of good fresh water for chicha, its palaces for nobles and priests and its dormitories for the women who had been chosen to be Virgins of the Sun. Such a sanctuary had been encountered by Pizarro and the conquistadors when they entered Cuzco. We found one somewhere else. It was constructed with the utmost care by the most skillful architects and masons in the most inaccessible parts of the Andes. Idols of the Inkas: Inti, Uana Cauri, Tambo Toco, Pacari Tambo. The Intihuatana stone, the 'hitching post of the sun' at Machu Picchu.